The P1Y1 mod. 11 is a Rank IV Japanese dive bomber with a battle rating of 4.7 (AB/RB/SB). It was introduced in Update 1.63 "Desert Hunters". In arcade battles, the light payload is somewhat countered by the ability to reload. 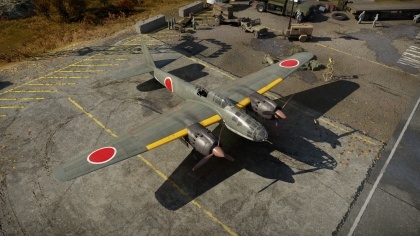 It is recommended to use the plane to hit high value targets such as pillboxes, since it is limited to 2 bombs (though it is one of the few Japanese med bombers able to carry 2 x 500 kg). Other planes with larger numbers of 60 kg bombs are better suited for taking out tanks and soft targets. It is at a huge disadvantage when compared to planes such as the B7A2, which has forward cannons able to strafe soft ground targets while bombs reload. 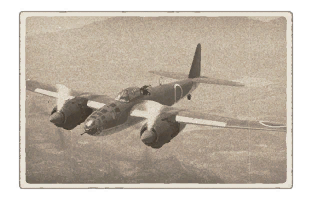 As such, most pilots would use the B7A2 over the P1Y1, though this plane may still be useful in one's lineup for use after the B7A2 has been lost. In realistic air battles, this plane thrives as a torpedo bomber on naval maps. Its high speed allows it to get in and get out quickly, and even though it only carries one torpedo, it can make multiple runs during a battle. In realistic tank battles, the best option is likely to take the 2 x 500 kg bomb option and again use its speed to quickly get in, hit 2 targets and run away before enemy fighters realize it is there and intercept. Again, its speed should allow multiple runs somewhat making up for the light payload. Forward turret has very limited firing arc, and AI gunner rarely engages. War Thunder Forum - Aircraft Data Sheets - P1Y1 mod.11 "Ginga"
This page was last edited on 19 December 2018, at 01:07.